Leave the hustle and bustle of the city behind you as you take in the sights and sounds of the fresh and relaxing country air. 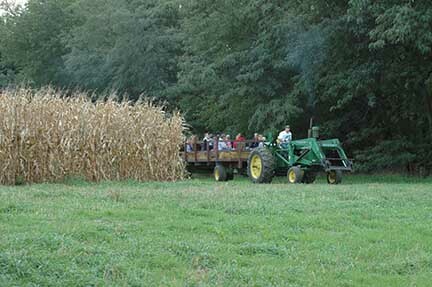 Hayrack Rides are perfect for groups of all kinds: companies, church groups, civic groups, friends and families. Spend time with friends or family before and after the ride at your very own private, wooded campfire area where you have picnic tables, lights, power and fresh water for your use. 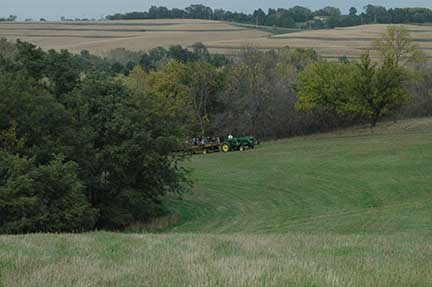 Private Hayrack Rides are available days and evenings and are approximately 45 minutes long. over 100+ acres of endless, scenic wooded trails! Unlike some other facilities, your hayrack ride includes your very own campfire area surrounded by trees. It's your ride, your campfire, your group. You won't share with anyone else so it's all yours and private! To make it even easier, we supply the wood and start your fire for you. Each campfire area has its own lights, picnic tables and electrical outlets. A minimum deposit is required which will be applied towards the cost of your Hayrack Ride. Rent our 100 year-old Vintage Barn for only an additional $250 with the campfire. It's air-conditioned, too! First-come, First-served so BOOK NOW! E-Mail Us or Call for more information. BOOK SOON so you can get the date(s) you want! For your convenience, here's the current Nebraska Cornhusker's 2018-19 Football Schedule. *Conference Game. From www.huskers.com, 9/3/18. All Information is subject to change without notice. Santa’s Woods is not responsible for errors.